About the Symbols for Writers Series: I’ve found that symbols and imagery can trigger valuable insights into writing, life, problem-solving, finding joy, and more. This series was born because I wanted a collection of symbolic images coupled with text and questions intended to kick-start the creative process, help identify a creative block, or aid expression of complex concepts in condensed packages–and I thought you might enjoy such a collection, too! If you’d like to know more, check out last week’s post. Following the image is a brief visualization exercise to help you identify what the image means to your subconscious–but there are no rules. If you prefer, skip to the suggested meanings that follow and see if any resonate. You can also use the image as a creative prompt, or as a reminder of some key idea you want to remember in the coming week. Take a good look at the image above, then close your eyes and take a few deep breaths. Let your mind relax and wander a moment, then imagine the clock shown above. What emotion does the image trigger? Does it bring to mind a particular project, scene, or character? Or perhaps a situation or person in the “real world”? When you have something in mind, ask your subconscious if that’s right–if you’re on the right track–and then sit quietly to see if you sense an answer. 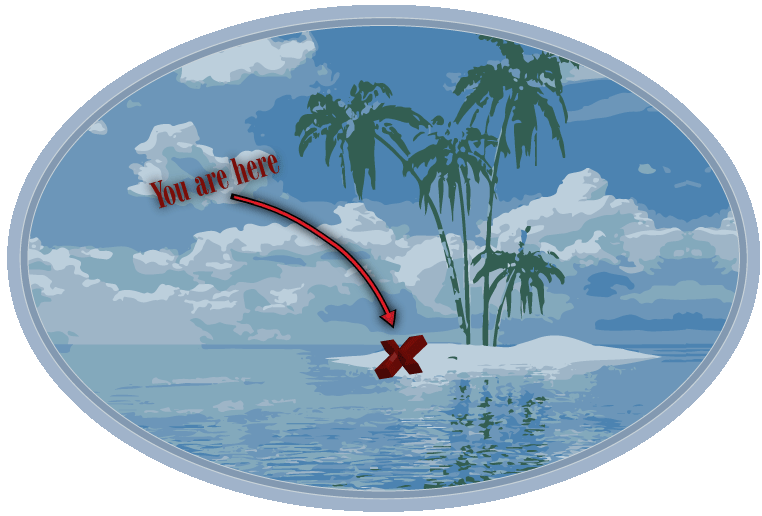 An island can symbolize a sense of isolation and loneliness. The act of creating is often a solitary process, and a writer’s life can be isolating. If this meaning resonates, consider whether you need to increase time spent on meaningful relationships in your life. This image might also remind you that you need more time alone to dive more deeply into your current project. In a dream, an island is sometimes interpreted as “place of the wishes and imagination which mostly lacks the relation to the reality.” Could visualizing an island help your subconscious to visit the imagination’s playground? Spend some time exploring this island in your imagination. What do you discover? I will be posting a new “card” every Thursday. Please let me know what you like or don’t like, and what you might suggest for future images. Are there particular concepts or issues you’d like these images to explore? I’d love to hear your thoughts, feedback, and suggestions!